While it's not exactly known who created the very first pecan log roll, many would argue that it was Mrs. Stuckey who actually perfected it. 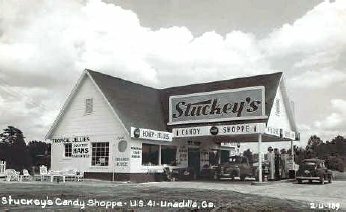 The signature item within all Stuckey's stores and the "must have" purchase during family travel stops from the 1950's through today, the candy was first made in the candy kitchen attached to each store. In eight Stuckey's stores in the years after World War II, employees faithfully followed Mrs. Stuckey's original southern recipe. The maraschino cherry-laced nougat was hand dipped in hot, creamy melted caramel, then before cooling, freshly shelled pecan halves would be liberally sprinkled onto the caramel. Each pecan log roll was hand wrapped and delivered straight to the customer.